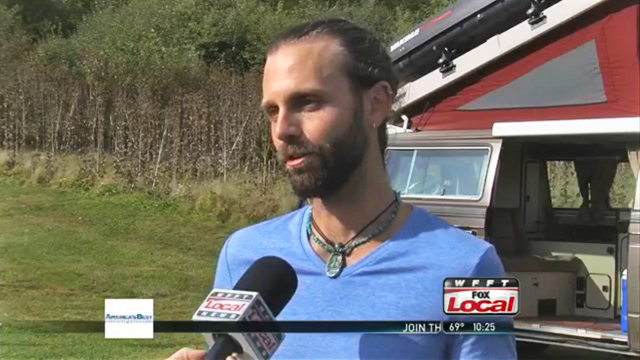 Living in a van has a lot of benefits…simplicity, freedom, adventure, and this week I was interviewed by Brooke Welch of WFFT-TV in Fort Wayne, Indiana about the Green aspect of VanLife. Watch the interview below. Thank you Brooke! Living in a house, while comfortable, can use a lot of energy and produce a lot of pollution. One way to reduce your carbon footprint, is to downsize. The van in the background looks like a standard mode of transportation. For Chris Clemens, it’s actually his home. Clemens quit his fulltime job in Santa Barbara a couple months ago, and has been traveling around the United States since. The van has 80 square feet of living space. Storage for clothes, a two burner stove, a fridge, a ten gallon water tank,and Clemens moves the seats to make a bed.